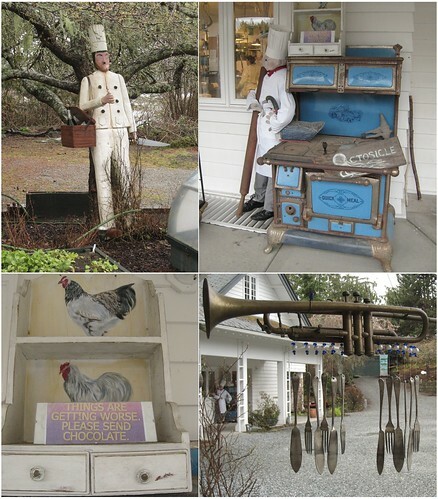 The Sooke Harbour House deserves more blog time than the one sentence I allotted in my last post. This lovely hotel combines nature, food, art, and relaxation anytime of the year (my four favourite things in life) and is just a short 40 minutes drive from Victoria, BC. 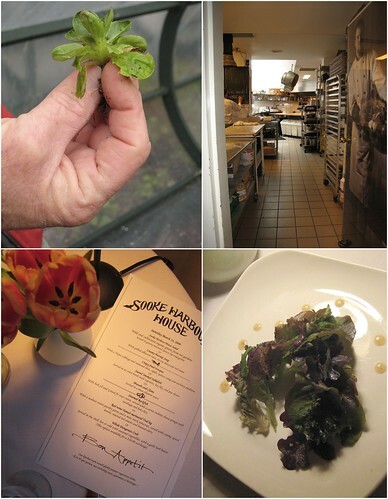 Overlooking the Olympic Peninsula, SHH is remarkable for so many reasons but my focus was on the culinary philosophy and offerings from this luxurious but whimsical destination. Both the exterior and interior of what is essentially a great big oceanfront house reflects SHH's devotion to all things food, celebrating the journey that food takes from the field or ocean to the plate. Even in the winter, wild greens flourish and end up in my Seventeen Leaf salad (I counted just to double check). Undoubtedly, the summer months would offer a more bountiful harvest of edible flowers, herbs, fruits, and vegetables but we were impressed by what was available during this cold dreary March, especially the 8 foot tall walking stick cabbage. As a city mouse, not a country mouse, having a wood-burning fireplace in our room, the Passion Flower room (appropriate since my all-time favourite pastry ingredient is passionfruit), was a novelty. Every nook and cranny of the house is covered in local artwork inspired by the natural vistas and wildlife from land and sea. 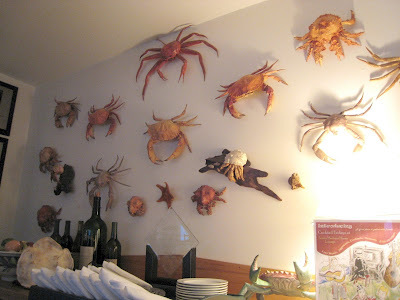 The wall of crabs in the dining room was particularly amusing, especially because of Eric's birthday cake. There is very little negative to say about the SHH, except that I did not like the deconstructed apple strudel which concluded the seven-course tasting menu. Exceedingly sweet, it was a far cry from the impressive trio of sorbets we had the night before, pairing local flavours such as apricot and sage in creamy form. Ignoring this minute detail, our weekend at the Sooke Harbour House was the perfect romantic getaway to celebrate four decades of Eric's existence with outstanding local cuisine and beautiful surroundings. I have never successfully organized any event which involved an element of surprise, mainly because I am a notably bad actor/liar. This weekend, however, required major covert operations in order to celebrate Eric's 40th birthday in high style without his knowledge. Even the taxi driver was in on the surprise as I kidnapped him to his first helicopter ride to Victoria and onwards to Sooke for a relaxing and luxurious excursion at Sooke Harbour House. The problem was that I had also promised to make him a cake of his choosing before deciding to spend his birthday out of town. Eric has an affinity for crab, biologically and gastronomically. Many of our travels, including this weekend, have involved tidepooling and in fact, we were engaged in Tofino in the rain, surrounded by a large party of star fish. 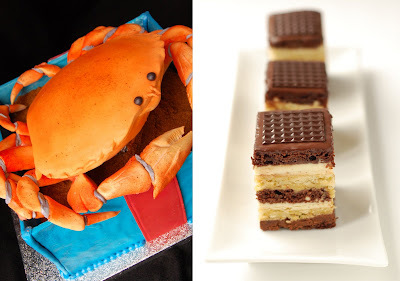 Hence, he choose a crab-themed birthday cake to be served after our return on Monday, giving me a challenge, both technically and logistically. Working with pastillage was the best choice since I needed a medium which allowed me to work well in advance. Using a live (later cooked and eaten) Dungeness crab model, I shaped the leg segments by hand from pastillage which were airbrushed with my new Aztek airbrush system which I love. The sides of the gift box (and a lid with bow which I forgot to photograph!) 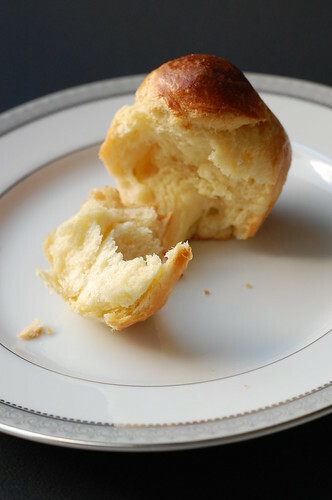 were also made of pastillage. The cake itself was also made in advance and frozen after being masked in buttercream. 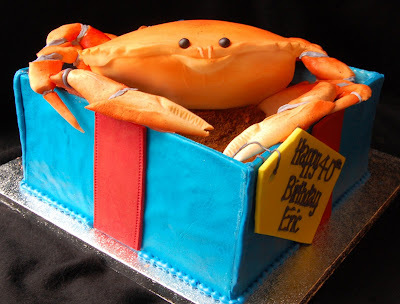 An 8" x 8" square cake served as the gift box interior and the crab's body was carved from a 6" diameter round cake. 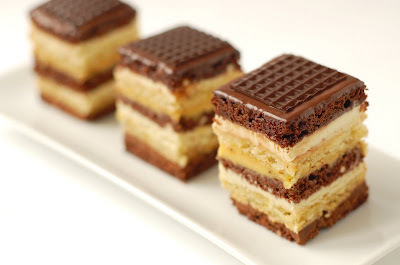 Three layers of chocolate cake and two layers of pistachio dacquoise were sandwiched by dark chocolate ganache, passionfruit curd, and pistachio mousseline. 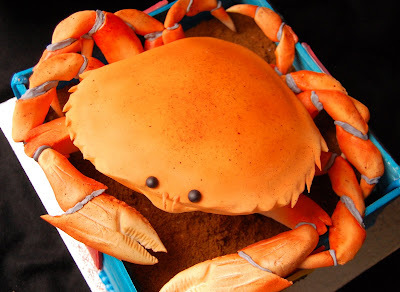 After returning home on Sunday night, I covered the crab's body in rolled fondant and airbrushed the final details. Don't you love its smiling face? The element of surpise with Eric's Crab birthday cake was not the cake itself since it is impossible to hide multiple crab parts littered throughout the kitchen from the husband. Instead, the expectation was that this cake was to be served at a small family dinner Monday evening; however, I stealthily planned to present the Crab to him at work Monday morning which meant I only had a rushed few hours to assemble, photograph, and deliver the Crab intact. With only a few minor hiccups, the Crab was a hit, finally cut and consumed after great initial reluctance to destroy it. Happy Birthday Eric! Forty is the new thirty!